The United National Party (UNP) has declared that Ranil Wickremesinghe will continue to be the party’s official candidate for prime minister, in a letter to the Tamil National Alliance on Friday. 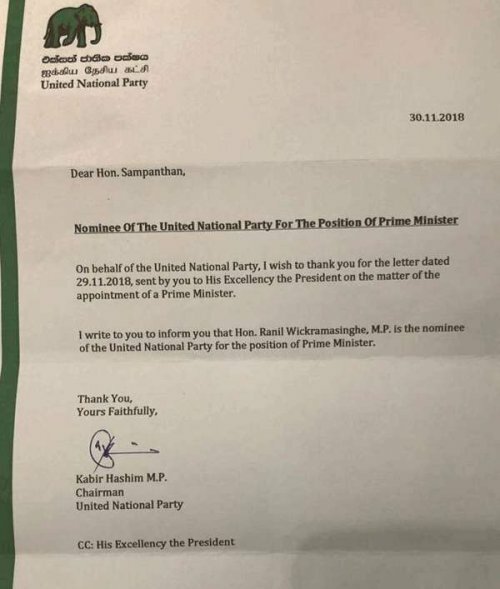 In a letter addressed to TNA Leader R Sampanthan , UNP Chairman MP Kabir Hashim stated, "Ranil Wickremesinghe, MP, is the nominee of the United National Party for the position of Prime Minister". The letter also thanked the TNA for their letter to Sri Lanka’s president Maithripala Sirisena last week, which called for a “restoration of a Government headed by the UNF as it existed prior to 26th October” or the appointment of a UNF nominee to the post. See the full text of the letter below. Sri Lanka was plunged into political crisis after Sirisena appointed former president Mahinda Rajapaksa, who oversaw a massive military offensive which killed tens of thousands of Tamils, to the post of prime minister before dissolving parliament. The reconvening of parliament saw violent scenes as chairs, chilli powder books were thrown at the Speaker and towards police officers. One MP was seen wielding a knife inside the parliamentary complex.